Gu Hui’s shoulders shook lightly. 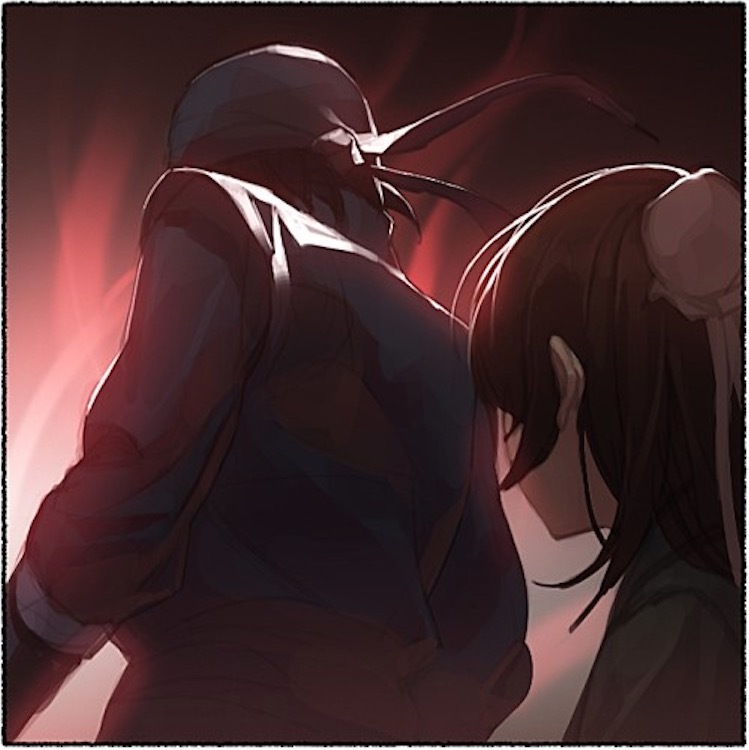 His actions had no warning whatsoever, and when Cho Ryu Hyang’s eyes began to widen from surprise, Un Hui’s body moved like a shadow in front of Cho Ryu Hyang. A cloud of dust rose up, and a huge movement of inner energy blew Cho Ryu Hyang’s hair upwards. Un Hui was unable to say anything. His body was still recovering. Un Hui desperately tried to manage the injury inside himself. He had expected the attack’s trajectory and prepared himself to take it, but the energy that flowed into him from the attack was even more massive than he had thought. Even for experts in the harmonious stage, the difference in power existed. The man in front of Un Hui wasn’t someone he could take on, even when he was in his best condition. Right then, Cho Ryu Hyang, who was standing behind Un Hui, stepped sideways, and opened his mouth. Was this boy a madman? Did he really not realize what kind of situation he was in? Right then, the little boy opened his mouth and had a chilly gaze in his eyes. It almost seemed like the boy spat out his words. Gu Hui, at this moment, felt uncomfortable for an unknown reason. The moment he thought about this, he realized why he was feeling like this. The eyes that the kid had wasn’t that of a madman’s. Those eyes were those of someone who was far above somebody else. Cho Ryu Hyang drew another line across the one he drew already on the floor, forming a cross. Gu Hui, after seeing this, made a surprised face. Now that he thought about it. this situation in itself was peculiar. There was no reason why the heir would just appear, was there? And just who would have the gall to be so calm in a massive formation like this? After thinking this far, Gu Hui began moving. He realized that this was not the time to fool around. There was a powerful warning signal going on in his mind. Gu Hui’s hands began to turn red like the sunset. Un Hui, upon seeing this, took out his sword and lowered his posture. He had to prevent the man from even touching the heir. As long as he, Un Hui, was alive, Gu Hui wouldn’t be even able to get near the heir. Un Hui bit down on his teeth and prepared himself to receive the strike. You dare think you had even the qualifications to block the attack? Gu Hui was planning on using his most powerful move right from the get-go. It was unfortunate that he would not be able to play with the man in front of him right now, but there was no choice. He had to kill the boy before anything strange happened. If he didn’t do that, things would quickly become extremely complicated. Once the amount of red energy on his fists reached its peak, Gu Hui charged at Cho Ryu Hyang. With it, the air around Gu Hui burned away with a reddish light. The man was charging like a cannonball with an appearance that resembled a giant sun. Un Hui caught his breath and exhaled slowly. Then, he drew a circle in front of him using the sword in his hand. A grey light appeared on the path of the sword. This was the strongest move that Un Hui knew so far. The move that he created using everything he had seen and learned so far. From the circle came an immense amount of power, and Un Hui’s body began to get sucked into the circle. This wasn’t something that the boy could stop right now. After all, neither of them were able to stop their attacks at this point. Un Hui was starting to feel a little confused. Some time had already passed since the two used their moves, but they still hadn’t collided. The same face of confusion was on Gu Hui’s face as well. No matter how much either of them ran, they didn’t get nearer. Gu Hui stopped walking and looked at Cho Ryu Hyang. A feeling of danger passed by behind his back. When he slowly turned back, he could see that his subordinates had disappeared. It was just a single moment when he separated from them, but that moment was enough to separate him from the group. Gu Hui was filled with a feeling of desperation. The boiling energy inside him disappeared. The boy provoked him in order to get him to move. And the moment he made an irrational move, the boy separated him from everyone else. Gu Hui took a look around himself. The formation, as he expected, had no holes in it. That boy had been controlling the area this entire time. Gu Hui bit down on his teeth. He was getting angry at himself for being such an idiot. He had made a huge mistake. The boiling emotions inside him exploded for an instant, then faded away just as quickly as they came. He was furious at himself for being played by a child. After pushing away his rage into one corner of his mind, Gu Hui attempted to analyze the situation calmly, and he reached a conclusion immediately. Then what should he do? There was only a single way to get out of this situation. The people he brought were elites from the Nanman Beast Gate. Each one of them was powerful, but there was no guarantee that they could survive the formation. It would be very hard for them to survive in a formation made by someone like this. Cho Ryu Hyang put on his glasses and responded calmly. Cho Ryu Hyang responded honestly. It was impossible to get someone like this with a formation he had now. The best he could do was to tie the man down. This made Cho Ryu Hyang feel very troubled about his next moves. Cho Ryu Hyang tilted his head. He was calculating if Gu Hui could do any harm to him. Soon enough, he reached a conclusion. Cho Ryu Hyang was certain of his conclusion. There was no way Gu Hui would even be able to touch him. As long as Cho Ryu Hyang was focused, Gu Hui had no way of touching him. A sudden, seemingly random statement. There was no way Cho Ryu Hyang would be provoked by something like this. Gu Hui looked at Cho Ryu Hyang with calm eyes and smirked. Cho Ryu Hyang twitched after hearing this. Cho Ryu Hyang’s face didn’t change one bit despite having heard an extremely insulting statement. And with a tone that implied “what’s the problem with that?”, Gu Hui lost his ability to speak. He had never come across anyone like this before. After thinking for a moment, Gu Hui opened his mouth with a determined face. Gu Hui nodded without hesitation. Cho Ryu Hyang, seeing this, reviewed the situation Gu Hui was in once again. Like before, he reached the conclusion that “it was impossible” for Gu Hui to get at him. Cho Ryu Hyang was standing with his arms crossed. According to his calculations, Gu Hui could see him but could never reach him. After all, the distance between them, while seemingly small, was actually extremely large. The Sichuan branch of the church was a place containing thousands of people. The distance between Gu Hui and Cho Ryu Hyang was close to the size of the perimeter of this Sichuan branch. As such, it was impossible for Gu Hui to get near him. If it was, then he wanted to see it. He wanted to see a variable that could exceed the calculations. Gu Hui looked at this Cho Ryu Hyang quietly. Even now, Gu Hui was considering if what he was doing was right. Honestly, it would be good to just waste the boy’s time here. After all, there were people other than him here. Plus, he trusted Juk Hyul Myung. That guy was sure to do something. There was, in all honesty, no need for him to make a move. He was worried about his subordinates. He didn’t know in what situation they were, and that worried him. Since a new variable came up, he no longer had a choice. Gu Hui lifted his right arm. Then, he began to gather his strength into it. A red energy similar to the light of the sun began to come out of his body, then concentrated onto the tip of his fingers. The air began to tremble violently with a dangerous sound. Cho Ryu Hyang wasn’t afraid, even as he looked at Gu Hui’s movements. No matter how great the man’s move may be, there was no way the attack would come his way. Cho Ryu Hyang trusted that. Gu Hui’s eyes met with Cho Ryu Hyang’s. Both of them were confident in their weapon’s strength, and soon enough, the value of their weapons would be proven. Gu Hui, as he sweat profusely, lifted his right hand carefully. Then, the energy in his hand turned into a red bead in front of him. Un Hui, upon seeing this, widened his eyes. That bead was the Gang Bead, a form of inner energy that one could only used by an extremely powerful expert. Surprisingly enough, Gu Hui was almost as strong as the Three Emperors. Cho Ryu Hyang looked at the red bead carefully. The original speed of the Gang Bead was almost blinding. But right now, it seemed to crawl towards Cho Ryu Hyang at a snail’s pace. Cho Ryu Hyang continuously calculated in his brain. And he did all that he could to move himself further away from the bead. Even so, the bead slowly moved closer to him. Cho Ryu Hyang began to sweat. The distance between he and Gu Hui was huge. But that bead was crossing that gap between the two like lightning. The bead came right in front of him. Something like glass broke in front of Cho Ryu Hyang. At the same time, the bead’s speed began to speed up. Despair floated into Cho Ryu Hyang’s mind when he saw this. There was no way to dodge that thing. Cho Ryu Hyang was sent flying back with a huge explosion. When he fell down on the ground, he made a confused face. When he looked up, though, he managed to see that somebody had blocked the blow for him. Un Hui had blocked the blow for Cho Ryu Hyang. This made Cho Ryu Hyang feel extremely thankful. He had the strongest bodyguard, didn’t he? This made Cho Ryu Hyang smile. Strangely enough, he didn’t get a response. This made a feeling of fright come over him. Cho Ryu Hyang quickly stood up and grabbed Un Hui’s arm.